This is the October 11, 1752 Marriage of Jose Antonio Cavazos and Maria Leonor de Treviño in Monterrey, Nuevo Leon, Mexico. Jose Antonio and Leonor are my 6th great grandparents. 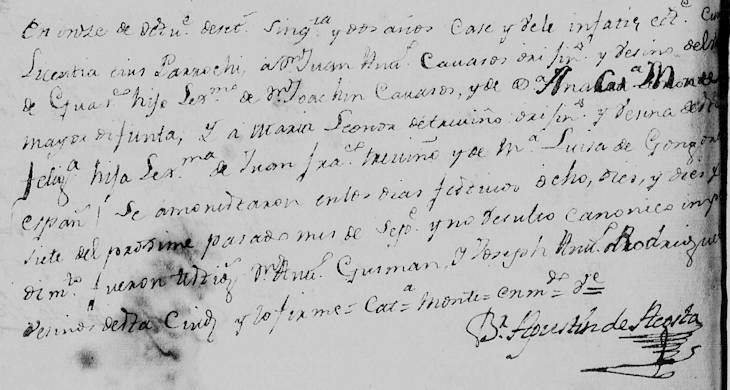 This record indicates that the parents of Jose Antonio are Joachin Cavazos and Ana Catarina de Montemayor. Ana Catarina is listed "difunta" meaning that she had already died before the wedding. This clue helps me narrow down the death records that I will be searching. The parents of Maria Leonor are listed as Juan Francisco Trevino and Maria Luisa de Gongora. "México, Nuevo León, registros parroquiales, 1667-1981," database with images, FamilySearch (https://familysearch.org/ark:/61903/3:1:9Q97-YS2H-CZ?cc=1473204&wc=3PML-VZS%3A45389701%2C45389702%2C46695301 : 21 May 2014), Monterrey > Catedral > Matrimonios 1667-1800 > image 282 of 732; Parroquias de la Iglesia Católica, Nuevo León (Catholic Church parishes, Nuevo León). Crispin D. Rendon - Ancestor Book for Moises Garza (3430 Bahia Place, Riverside, CA 92507, Crispin D Rendon, February 9, 2014), Personal Archives of Moises Garza, Pg. 55. Cavazos, Juaquin, Fernandez and Rodriguez, Ana Catarina are my 5th great grandparents on my paternal side. Moises, you and I are listed as being 3rd/4th cousins on Ancestry.com. It is my understanding that 3rd/4th cousins share the same great grandparents. Question: Do you happen to know what happened to the Santiago, NL Church baptism records for years 1843-1848. The file for years 1841-1848 Bautismos is on Familysearch.org however, the file only contains 121 records and these are for years 1841-1842. I have written several times asking about these records but to date have not received a response. Maybe you could inquire about them? If possible, thank you in advance.